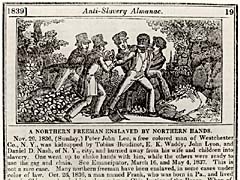 click image for close-up Although many antislavery societies had emerged in the 1830s throughout the North, abolitionists and antislavery sympathizers were greatly outnumbered by those who felt no aversion to slavery. Some northerners went so far as to capture blacks and send them into slavery. Nov. 20, 1836, (Sunday,) Peter John Lee, a free colored man of Westchester Co., N.Y., was kidnapped by Tobias Boudinot, E. K. Waddy, John Lyon, and Daniel D. Nach, of N. Y., city, and hurried away from his wife and children into slavery. One went up to shake hands with him, while the others were ready to use the gag and chain. . . . This is not a rare case. Many northern freeman have been enslaved, in some cases under color of law. Oct. 26, 1836, a man named Frank, who was born in Pa., and lived free in Ohio, was hurried into slavery by an Ohio Justice of the Peace. When offered for sale in Louisiana, he so clearly stated the facts that a slaveholding court declared him FREE --thus giving a withering rebuke to northern servility.